LEWISTOWN - The man accused of making a false Amber Alert in December pleaded guilty Monday. Mitchell Dutz, 18 of Mason City, was sentenced to three years in state prison, according to the Peoria Journal Star. He faced four felony charges related to making a false report with the Farmington Police Department regarding a child abduction. Dutz initially pleaded not guilty on Dec. 26. His trial was set to begin Feb. 19. Charges included obstructing justice, motor vehicle burglary, telephone harassment and filing a false police report. The Journal Star reports Dutz accepted an agreement to plead guilty to charges of motor-vehicle burglary and disorderly conduct related to the incident. Dutz lied when he reported three black men stole his car with a 13-month-old baby inside back in December. He used a photo from social media of a child that did not belong to him. According to police chief Chris Darsham, authorities had reason to believe Dutz's story because his story remained consistent and he quickly produced a photo of the child, even having the picture saved as his phone's background. 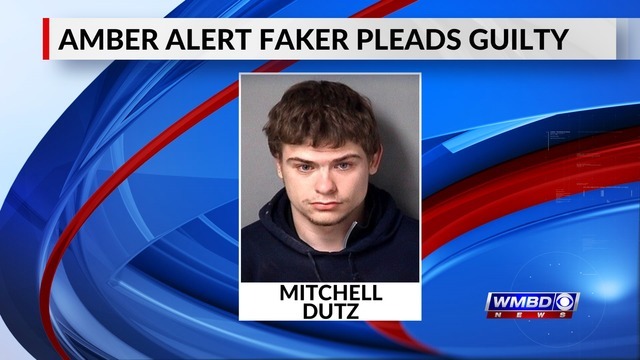 When authorities requested contact information for the child's mother, Dutz provided a phone number, though no one answered, Darsham had said.